Australia's claim for the title of 'Smallest Bees in the World' are the minute yellow and black Quasihesma bees of far northern Australia. Our smallest species, Euryglossina (Quasihesma) clypearis from Cape York, Queensland, has males that are just 1.8 mm long. 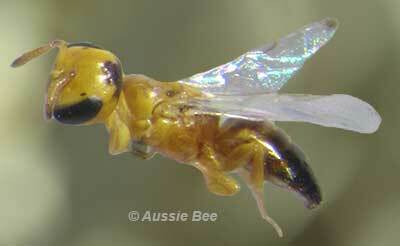 Above: one of the minute Quasihesma bees from Cape York, Queensland. In North America, there is another minute bee called Perdita minima which also claims the 'World's Smallest Bee' title. With such tiny insects, it is difficult to be sure which is the smaller, but they are both exceptionally small bees! 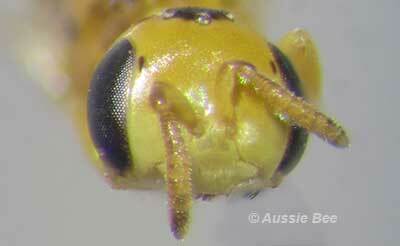 Australia's Quasihesma bees are smooth, nearly hairless bees in the family Colletidae. Their heads and jaws have bright black and yellow patterns that may play a role in their mating behaviour. They can be abundant visitors to Eucalyptus blossom and may nest in tiny borer holes in the trees. Above: the bright yellow and black patterns on the face of this tiny Quasihesma bee. The Largest Bee in the World is a giant 39 mm long bee with enormous pointy jaws from the jungles of Indonesia, called Megachile pluto. However, Australia's largest bee is the 24 mm long Great Carpenter Bee, Xylocopa. 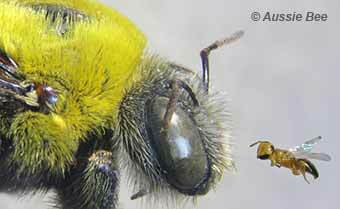 Above: Australia's smallest bees, the minute Quasihesma bees, are dwarfed by our largest bees, the yellow and black Great Carpenter Bees. Read the fascinating story of how the World's Largest Bee was lost for 100 years, then rediscovered! 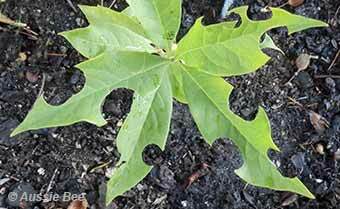 Other Galleries of Native Bee Photos.